After six years of writing this stupid blog you'd think we'd know what we're doing, but sometimes we can't even figure out the name of a place. When this tiny joint opened the signage was all in Chinese. What to call it? We asked the owners what the English name was but they just looked at us blankly, like we're idiots. A fair assumption. Some dude on Instagram told us the Chinese name roughly translates to Grandma Liu's Hamburgers. Then a sign outside appears that suggests the name is Liu Lao Lao Burger. Between ourselves we call it Grandma's Hamburgers, but officially we'll call it Liu Lao Lao Burger. It truly is a hole in the wall resto. There's a counter and a small bench along with window about four seats. 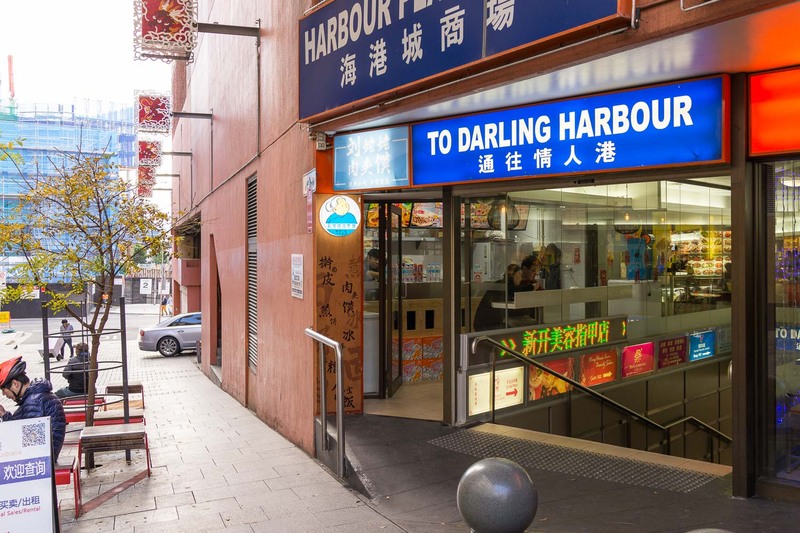 It's tiny but a bright and cheery spot to sit and watch the wonders of the Dixon Street Mall. To add to the vibe we have lovely uncles and aunties running the show, chattering and chopping in the background, while the radio is tuned to what sounds like the Chinese version of Radio National. Or maybe it's Chinese Alan Jones. Who knows. It only takes a small stretch of the imagination to feel like we're in some sidestreet mum'n'pop resto in boondock China. Beautiful. Pork miced (mixed or minced?) 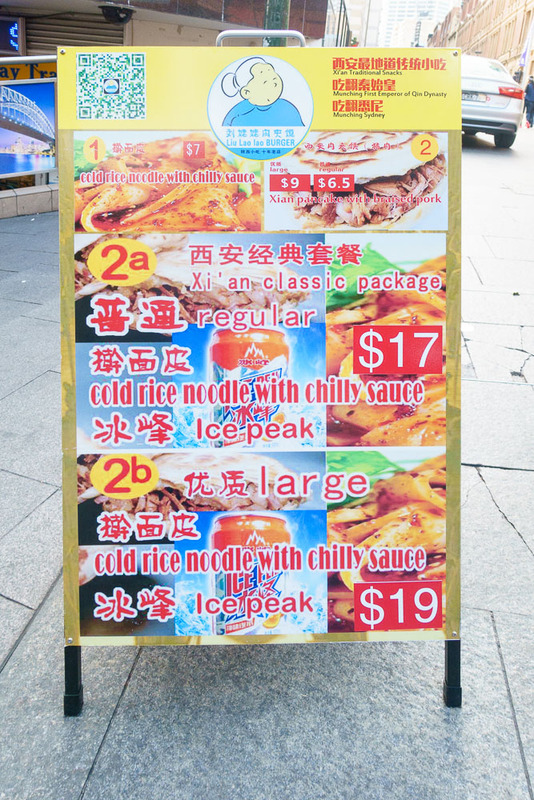 noodle - $8.50. Specks of pork and a healthy handful of finely diced veggies, mushies and tofu. It's a real gentle nurturing country style soup. The mix of veggies and the gentleness of the broth has Grandma's subtle touch. You can also whack the flavour up to the next level by adding a dab of the supplied chili paste. 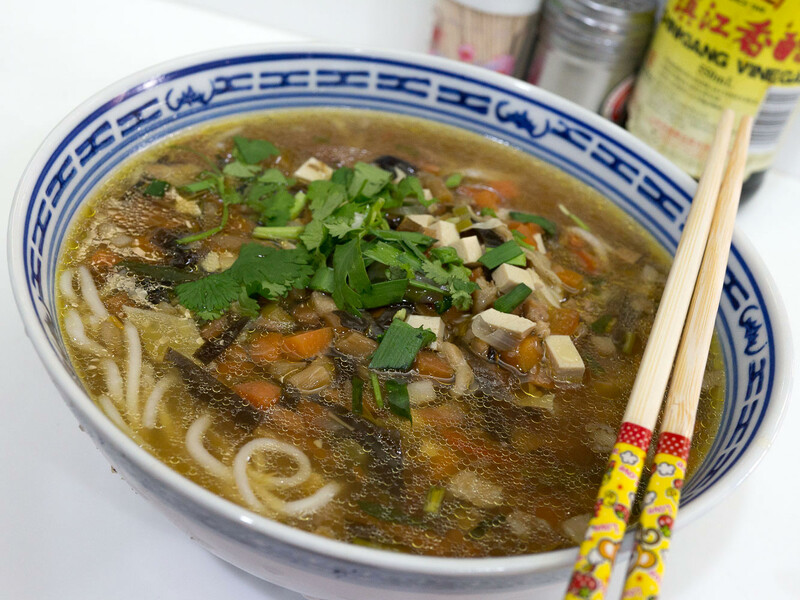 We've had this soup a couple of times now, it's a new Chinatown favourite. Chinese pork hamburger - $6.50. We're big fans of the Chinese hamburger and this one is a beauty. The bun is warm and crisp on top, and there's quite a lot of spicy pulled pork in between. 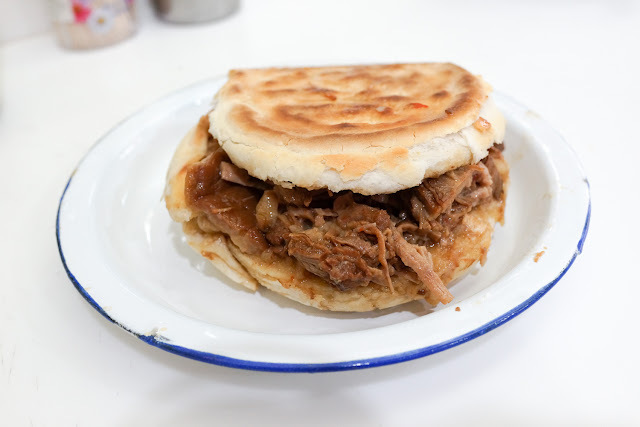 It's pricey for a Chinese burger but there's quite a lot of meat in those buns, highly recommended, though X'ian Cuisine is still the king of Chinese hamburgers we reckon, only by a hair. 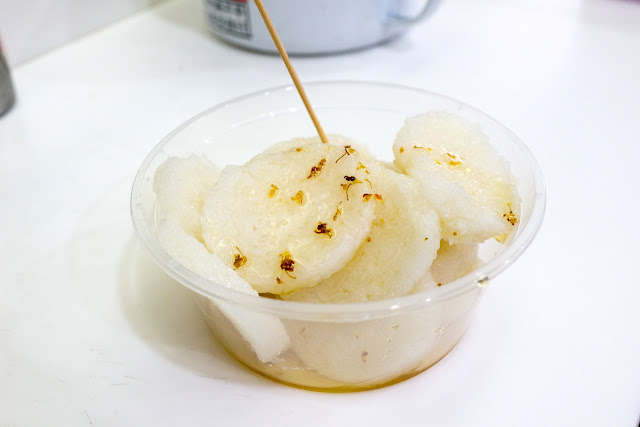 Cold sticky rice cakes with honey - $4. These are as advertised, kinda plain but interesting to try all the same. The rice cakes were removed from a cloth which suggests they are hand made, the runny honey sauce is moreish. 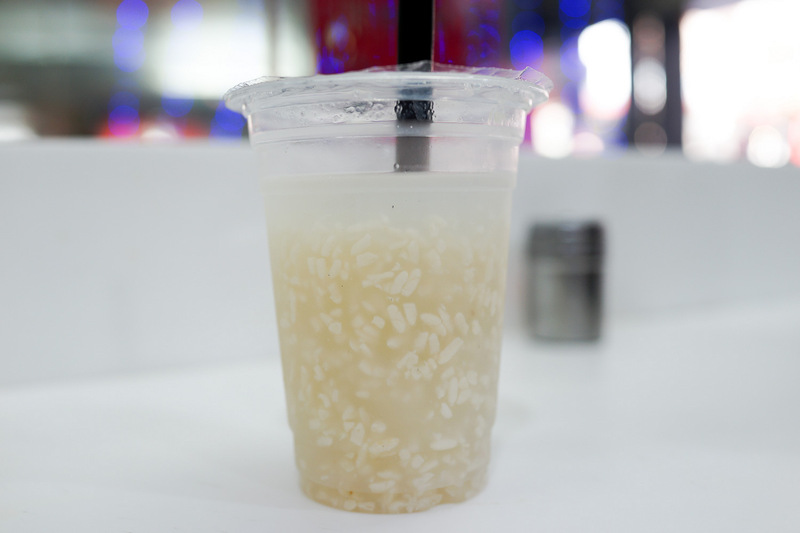 The fermented rice ($4) is a surprise hit for us. It's a sweet, but not too sweet, drinky-poo with a unique fruity flavour to it. On a second visit it tasted funkier and less sweet. Spaghetti (about $10) . This is your classic Chinese spaghetti - mince pork on noodles. Chinese spaghetti is always a winner. Cold chili noodle ($7). 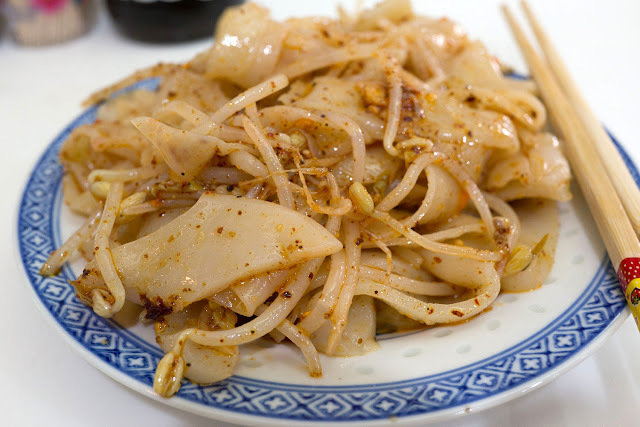 This is a great version of one Shawn's all-time favourite Chinese dishes - lovely chumpy noodles in chili oil. There's one word for it, albeit wanky: umami. 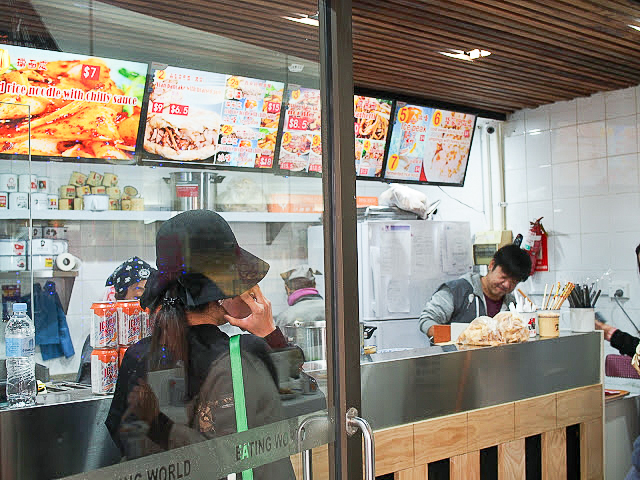 Liu Lao Lao Burger is in Eating World Food Court, Chinatown. It's in the funny little bit with it's own separate door next to the staircase, where the Vietnamese roll place used to be. 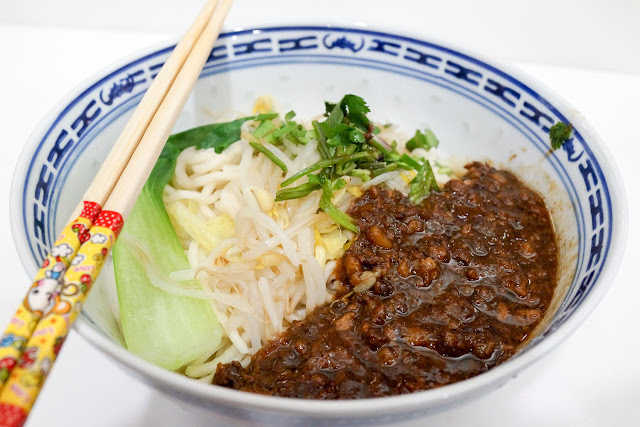 that minced pork noodle soup must be a classic shaanxi dish, i had the same thing at a new place in dixon food court (called mum... something?). also when i was there face2face was closed?? 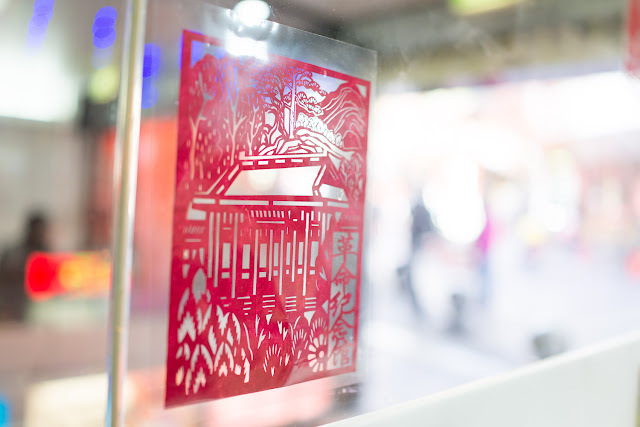 there was a big sign on the shutter but it was in chinese... hopefully they're just on holiday! Face to Face is back - the lady just said they closed for a month. Go figure.